Same as last season we are using the official English Premier Leagues Fantasy Football - www.fantasy.premierleague.com for our fantasy managers to do battle over the title of the Ruff Gaming's Fantasy Football League! Last season saw X Bulldog take the title and the challenge will be set this season if anybody can take the title from him! If you are new to this fantasy football it is really simple to sign up and take part! Go to the above website, sign up (Its free and all you need is an Email address), make your team then take our private league code - 494615-123464 and enter it in the leagues section of the website. And that is it! Once you are all signed up you can post your team name below here so we know who is who and then get managing your team! Feel free to use this thread to chat about our fantasy football league and also ask any questions you might have on the league. Wackybar Hotspurs all signed up for the new season . After 38 hard fought matches from the Ruff Fantasy Football League 2013/14 season we have our Champion - X Bulldog! A massive well done to Rich (X Bulldog) for winning this years Ruff fantasy football league with his team - Liverpool Redsox. Which means that he holds onto his title for another year - he won last years league too! He earns himself (another) place into the the hallowed Ruff Gaming Hall of Fame! It was a close battle this year and there was less than 50 points between the top 2 and less then 70 points between the top 3! So that is another season of our league over with and it was great fun once again. 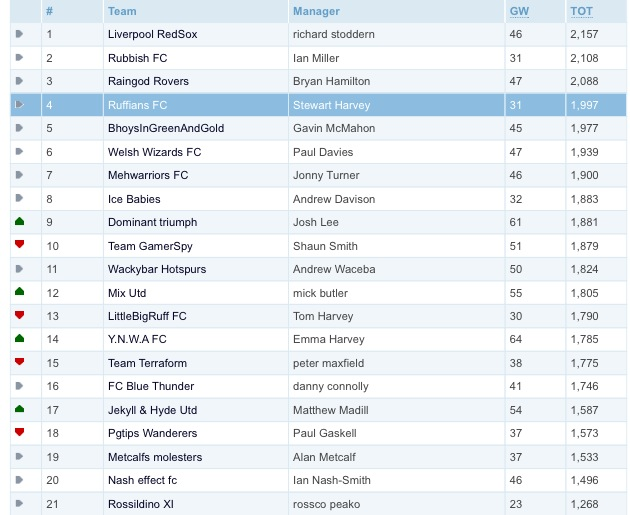 I would like to thank everybody that signed up this season (21 managers - a record amount for us!) and hopefully see you all again for next season. Also I would just mention it that I am planning to do a fantasy competition for the World Cup next month so keep an eye out here and on our twitter for more info! I was a bit lucky this year I hasn't touched my team for the last couple months but Suarez was captain haha. Massive well done Rich! I just couldn't catch you whatever I tried, I always was about 200pts behind. The battle continues Mr Raingod! Next year!!!! Can't believe I fell short of my target of 2000pts just by 3 damn points!!! You can tell I'm a Gooner with just grabbing 4th spot and getting a Champ league spot! Good fun though once again lads!